Dr. Parmjeet Randhawa received his MD from the All India Institute of Medical Sciences in 1983. He performed post-doctoral research at the University of Miami from 1984-1987, and followed it up by a residency in Pathology at the University of Pittsburgh, where he has spent the remainder of his academic career. He appointed as Assistant Professor of Pathology in July 1991, Associate Professor in January 1999, and Professor of Pathology with tenure in February 2007. 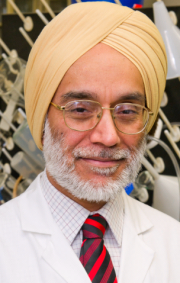 Dr. Randhawa’s career can be best categorized as that of a clinical-investigator, with a strong focus on polyomavirus BK infection after transplantation. He published the first ever well-documented case of BK virus nephritis diagnosed by needle biopsy. Following this initial discovery, he has made seminal contributions to the epidemiology, molecular biology, immunology, and pharmacology of this virus, supported by multiple NIH grants. He is also an internationally known transplant pathologist who contributed to the development of The Banff Schema for Renal Allograft Pathology. His work has helped better define the significance of several pathologic lesions in the transplanted kidney. His research is reported in the form of over 200 publications in highly regarded journals. He has served as a member of the education committee, abstract reviewer, session chair, and faculty presenter at several major conferences in transplantation. He has served as a member of several NIH study sections, and is a recipient of The American Society of Transplantation Established Investigator Award. Read Dr. Parmjeet Randhawa’s posts.